The Ford Model T (colloquially known as the Tin Lizzie and Flivver) is an automobile that was produced by Henry Ford's Ford Motor Company from 1908 through 1927. The Model T set 1908 as the historic year that the automobile came into popular usage. It is generally regarded as the first affordable automobile, the car that "put America on wheels"; some of this was because of Ford's innovations, including assembly line production instead of individual hand crafting, as well as the concept of paying the workers a wage proportionate to the cost of the car, so that they would provide a ready made market. The first production Model T was built on September 27, 1908, at the Piquette Plant in Detroit, Michigan . There were several cars produced or prototyped by Henry Ford from the founding of the company in 1903 until the Model T came along. Although he started with the Model A, there were not 19 production models (A through T); some were only prototypes. The production model immediately before the Model T was the Ford Model S, an upgraded version of the company's largest success to that point, the Model N. The follow-up was the Ford Model A and not the Model U. Company publicity said this was because the new car was such a departure from the old that Henry wanted to start all over again with the letter A. As it happens, the first Plymouth car (1928), built by competitor Chrysler Corporation, was named the Model U. "I will build a car for the great multitude. It will be large enough for the family, but small enough for the individual to run and care for. It will be constructed of the best materials, by the best men to be hired, after the simplest designs that modern engineering can devise. But it will be low in price that no man making a good salary will be unable to own one - and enjoy with his family the blessing of hours of pleasure in God's great open spaces." The Ford Model T car was designed by Childe Harold Wills and two Hungarian immigrants, Joseph A. Galamb and Eugene Farkas. Harry Love, C. J. Smith, Gus Degner and Peter E. Martin were also part of the team. While production of the Model T began in 1908, model years range from 1909 to 1927. The Model T had a front mounted, 177 in3 (2.9 L) four-cylinder en bloc motor (that is, all four in one block, as common now, rather than in individual castings, as common then) producing 20.2 hp (15 kW) for a top speed of 40-45 mph (64–72 km/h). The small four cylinder engine was known for its L heads, an early form of flathead engine configuration. According to Ford Motor, the Model T had fuel economy on the order of 13 to 21 mpg (5 to 9 kilometres per litre or 11.1 to 18.7 litres per 100 km). The engine was capable of running on gasoline, kerosene or ethanol, though the decreasing cost of gasoline and the later introduction of Prohibition in the United States made ethanol an impractical fuel. A flywheel magneto (broadly equivalent to a modern alternator) produced low voltage alternating current to power a trembler coil, which created a high voltage current. This ignition pulse was passed to the timer (analogous to a distributor in a modern vehicle) and redistributed to the firing cylinder. Ignition timing was adjusted manually by using the spark advance lever mounted on the steering column which rotated the timer. A battery could be used for starting current: at hand-cranking speed, the magneto did not always produce sufficient current (but was first available on early cars). A certain amount of skill and experience was required to find the optimal timing for any speed and load. When electric headlights were introduced in 1915, the magneto was upgraded to supply power for the lights and horn. In keeping with the goal of ultimate reliability and simplicity, the trembler coil and magneto ignition system was retained even after the car became equipped with a generator and battery for electric starting and lighting. Most cars sold after 1919 were equipped with electric starting, which was engaged by a small round button on the floor in front of the driver's seat. Before starting a Model T with the hand crank, the spark had to be manually retarded or the engine might "kick back". The crank handle was cupped in the palm, rather than grabbed with the thumb under the top of the handle, so that if the engine did kick back, the rapid reverse motion of the crank would throw the hand away from the handle, rather than violently twisting the wrist or breaking the thumb. 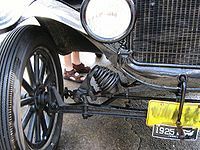 Most Model T Fords had the choke operated by a wire emerging from the bottom of the radiator where it could be operated with the left hand. This was used to prime the engine while cranking the engine slowly then starting the engine with the left hand with a rapid pull of the crank handle. The car's 10 gallon (38 litre) fuel tank was mounted to the frame beneath the front seat; one variant had the carburetor (a Holley Model G) modified to run on ethyl alcohol, to be made at home by the self-reliant farmer. Because fuel relied on gravity to flow forward from the fuel tank to the carburetor, a Model T could not climb a steep hill when the fuel level was low. The immediate solution was often to drive up steep hills in reverse. In 1926, the fuel tank was moved forward to under the cowl on most models. Early on the engine blocks were to be produced by the Lakeside Foundry on St. Jean in Detroit. Ford cancelled the deal before many engine blocks were produced. While the first few hundred Model Ts had a water pump, its use was abandoned early in production. Ford opted for a cheaper and more reliable circulation system based on the thermo-syphon principle. Hot water, being less dense, would rise to the top of the engine and up into the top of the radiator, descending to the bottom as it cooled, and back into the engine. This was the direction of water flow in most makes of cars even when they did have water pumps, until the introduction of crossflow radiator designs. Water pumps were also available as an aftermarket accessory for Model T.
The Model T was a rear-wheel drive vehicle. Its transmission was a planetary gear type billed as "three speed". In today's terms it would be considered a two speed, because one of the three speeds was actually reverse. The Model T's transmission was controlled with three foot pedals and a lever that was mounted to the road side of the driver's seat. The throttle was controlled with a lever on the steering wheel. The left pedal was used to engage the gear. With the handbrake in either the mid position or fully forward and the pedal pressed and held forward the car entered low gear. When held in an intermediate position the car was in neutral, a state that could also be achieved by pulling the floor-mounted lever to an upright position. If the lever was pushed forward and the driver took his foot off the left pedal, the Model T entered high gear, but only when the handbrake lever was fully forward. The car could thus cruise without the driver having to press any of the pedals. There was no separate clutch pedal. The middle pedal was used to engage reverse gear, and the right pedal operated the engine brake. The floor lever also controlled the parking brake, which was activated by pulling the lever all the way back. This doubled as an emergency brake. Although it was extremely uncommon, the drive bands could fall out of adjustment, allowing the car to creep, particularly when cold, adding another hazard to attempting to start the car: a person cranking the engine could be forced backward while still holding the crank as the car crept forward even though it was nominally in neutral. As the car utilised a wet clutch, this condition can also occur in cold weather where the thickened cold oil acts somewhat like an adhesive and prevents the clutch discs from slipping freely. Power reached the differential through a single universal joint attached to a torque tube which drove the rear axle; some models (typically trucks, but available for cars as well) could be equipped with an optional two speed Ruckstell rear axle shifted by a floor mounted lever which provided an underdrive gear for easier hill climbing. All gears were vanadium steel running in an oil bath. Additionally the engine separately was independently adapted to other mechanisms for power . The suspension components of a Ford Model T.
The coil-spring device is an aftermarket accessory, the "Hassler shock absorber." Model T suspension employed a transversely mounted semi-elliptical spring for each of the front and rear axles, which was a solid beam axle, not an independent suspension, which still allowed a great deal of wheel movement to cope with the dirt roads of the time. The front axle was drop forge as a single piece of vanadium steel. Ford twisted many axles eight times and sent them to dealers to be put on display to demonstrate its superiority. The Model T did not have a modern service brake. The right foot pedal applied a band around a drum in the transmission, thus stopping the rear wheels from turning. The previously mentioned parking brake lever operated band brakes on the outside of the rear brake drums. Tires were pneumatic 30 in (76 cm) in diameter, 3.5 in (8.9 cm) wide in the rear, 2 in (5 cm) in the front. The old nomenclature for tire size changed from 30×3 to 21" (rim diameter) × 4.50 (tire width). All tires in this time period used an inner tube to hold the pressurized air; "tubeless" tires were not generally in use until much later. Wheelbase was 99 inches (250 cm); while standard tread width was 56 in (142 cm), 60 in (152 cm) tread could be obtained on special order, "for Southern roads". There were few major changes throughout the life of this model; early ones had a brass radiator and headlights. The horn and numerous small parts were also brass. Many of the early cars were open-bodied touring cars and runabouts, these being cheaper to make than closed cars. Prior to the 1911 model year (when front doors were added to the touring model), U.S.-made open cars did not have an opening door for the driver. Later models included closed cars (introduced in 1915), sedans, coupes and trucks. The chassis was available so trucks could be built to suit. Ford also developed some truck bodies for this chassis, designated the Model TT. The headlights were originally acetylene lamps made of brass (commonly using Prest-O-Lite tanks), but eventually the car gained electric lights, initially powered from the magneto until the electrical system was upgraded to a battery, generator and starter motor, when lighting power was switched to the battery source. The Model T originally employed some advanced technology, for example, its use of vanadium steel. Its durability was phenomenal, and many Model Ts and their parts were still in running order nearly a century later. By 1918, half of all cars in America were Model Ts. However, it was a monolithic bloc; as Ford wrote in his autobiography, "Any customer can have a car painted any color that he wants so long as it is black". Model Ts in different colors were produced from 1908 to 1914, and then again from 1926 to 1927. It is often stated that Ford chose black because the paint dried faster than other colored paints available at the time, and a faster drying paint would allow him to build cars faster since he would not have to wait as long for the paint to dry. The technical aspect of this explanation is plausible, as a black paint will absorb the most light and convert it to heat which will help the solvents in the paint to evaporate, however Ford engineering documents suggest black was chosen because it was cheap and durable. Over thirty different types of black paint were used on various parts of the Model T.These were formulated to satisfy the different means of applying the paint to the various parts, and they had distinct drying times, depending on the part, the paint, and the method of drying. The Model T was the first automobile mass produced on assembly lines with completely interchangeable parts, marketed to the middle class.The needed factory worker knowledge and skills were reduced to one of 84 areas. When introduced, the T used the building methods typical at the time, assembly by hand, and production was small. Ford's Piquette plant could not keep up with demand for the Model T, and only 11 cars were built there during the first full month of production. More and more machines were used to reduce the complexity within the 84 defined areas. In 1910, after assembling nearly 12,000 Model Ts, Henry Ford moved the company to the new Highland Park complex. As a result, Ford's cars came off the line in three minute intervals, much faster than previous methods, reducing production time by a factor of eight (requiring 12.5 hours before, 93 minutes afterwards), while using less manpower. By 1914, the assembly process for the Model T had been so streamlined it took only 93 minutes to assemble a car. That year Ford produced more cars than all other automakers combined. The Model T was a great commercial success, and by the time Henry made his 10 millionth car, 10 percent of all cars in the entire world were Fords. In fact, it was so successful that Ford did not purchase any advertising between 1917 and 1923; in total, more than 15 million Model Ts were manufactured, more than any other model of its day. Model T production was finally surpassed by the Volkswagen Beetle on February 17, 1972. Henry Ford's eccentric approach to research and development meant few changes to the vehicle were made over its lifetime; he believed the Model T was all the car a person would, or could, ever need. As other companies offered comfort and styling advantages, at competitive prices, the Model T lost market share. Eventually, on May 26, 1927, Ford Motor Company ceased production and began the changeovers required to produce the Model A. Model T engines continued to be produced until August 4, 1941. Almost 170,000 engines were built after car production stopped. Replacement engines were required to continue to service already produced vehicles. Racers and enthusiasts, forerunners of modern hot rodders, used the Model T's block to build popular and cheap racing engines, including Cragar, Navarro, and famously the Frontenac ("Fronty Fords") of the Chevrolet brothers, among many others. In 2002, Ford built a final batch of 6 Model Ts as part of their 2003 centenary celebrations. These cars were assembled from remaining new components and other parts produced from the original drawings. The last of these 6 was used for publicity purposes in the UK. The standard 4-seat open tourer of 1909 cost $850 (equivalent to $ today), when competing cars often cost $2,000-$3,000 (equivalent to $ -$ today); in 1913, the price dropped to $550 (equivalent to $ today), and $440 in 1915 (equivalent to $ today). Sales were 69,762 in 1911; 170,211 in 1912; 202,667 in 1913; 308,162 in 1914; and 501,462 in 1915. In 1914, an assembly line worker could buy a Model T with four months' pay. By the 1920s, the price had fallen to $290 (equivalent to $ today) because of increasing efficiencies of assembly line technique and volume. Henry employed vertical integration of the industries needed to create his cars. Henry Ford used wood scraps from the production of Model T's to create charcoal. Originally named Ford Charcoal the name was changed to Kingsford Charcoal after Ford's relative E. G. Kingsford brokered the selection of the new charcoal plant site. The Ford Model T was the first automobile built by various countries simultaneously since they were being produced in Walkerville, Canada and in Manchester, England starting in 1911 and were later assembled in Germany, Argentina, France, Spain, Denmark, Norway, Belgium, Brazil, Mexico, and Japan. Ford created a massive publicity machine in Detroit to ensure every newspaper carried stories and ads about the new product. Ford's network of local dealers made the car ubiquitous in virtually every city in North America. As independent dealers, the franchises grew rich and publicized not just the Ford but the very concept of automobiling; local motor clubs sprang up to help new drivers and to explore the countryside. Ford was always eager to sell to farmers, who looked on the vehicle as a commercial device to help their business. Sales skyrocketed—several years posted 100% gains on the previous year. Sales passed 250,000 in 1914. By 1916, as the price dropped to $360 for the basic touring car, sales reached 472,000. Cars built before 1919 are classed as veteran cars and later models as vintage cars. Today, three main clubs exist to support the preservation and restoration of these cars: The Model T Ford Club International, the Model T Ford Club of America and the combined clubs of Australia. With many chapters of clubs around the world, the Model T Ford Club of Victoria has a membership with a considerable number of uniquely Australian cars. (Australia produced its own car bodies and therefore many differences occurred between the Australian bodied tourers and the US/Canadian cars). Many steel Model T parts are still manufactured today, and even fiberglass replicas of their distinctive bodies, which are popular for T-bucket style hot rods (as immortalized in the Jan and Dean surf music song "Bucket T," which was later recorded by The Who). In 2008, there was an around Australia trip organised by various members of the NSW portion of the Combined model T clubs of Australia (http://www.modelt.2ya.com/). The trip lasted just over 6 months, all of this time the members ate, drank and slept in their cars that they had modified for the trip. They left Sydney on 20th, April and made it all the way to Echuca in Victoria for the 100 year anniversary of the model T Ford. People come from all over Australia, New Zealand and America for the trip to one major city in Australia that is held every 3 years, they stayed for a week in Echuca and participated in various activities organised by the Victoria club and eventually moved on to go home and see their families back in Sydney on the 9th, October 2008. Ford also attempted a buy on time program to aid sales, resembling that of the German Kdf-Wagen (forerunner of the Volkswagen Type 1). Ford's plan was not a success, either. Early Ford - models from the years 1903 - 1908; p. 5. Joyrides | Car of the Century? Ford's Model T, of course. Reynold M. Wik, Henry Ford Grass Roots America, 1972. Clymer, Floyd. Treasury of Early American Automobiles, 1877-1925 (New York: Bonanza Books, 1950), p. 100. 1926 - Model T Ford Club of America. Used for harvesting winter ice from ponds in Maine. Ford, My Life and Work, 1922, p. 72. Ward, Ian, ed. The World of Automobiles (London: Orbis, 1974), Volume 13, p. 1562. Georgano, G. N. Cars: Early and Vintage, 1886-1930. (London: Grange-Universal, 1985). www.auto-historia.com History of Ford Motors Argentina - Retrieved on 19 November 2008. Celebrating the Ford Model T, only 100 years young!, (in Spanish) accessed 22 September 2008. Jameson, Eric scholar of Automotive Studies.